So, Buono! ended up releasing an all-around great single as usual. I can never really find anything to dislike about their releases. Their A-sides have been great (even some of my favorite songs to date) since their debut, and their B-sides are sometimes just as good as the A-sides (Ex “Janakya Mottainai”, “JUICY HE@RT”). Really, I only ever have good things to say about Buono!, and not just because I have a lot of history with them. Basically what I’m saying is that, as usual, ｢夏ダカラ! (Natsu Dakara! )｣ turned out to be a great single. Onto the review. After even more listens, this song’s chorus hasn’t left my head. The whole song is just so easy to listen to, and it is really nice to hear the girls’ voices without the accompanying loud rock music that has stylized Buono! since 2008. I would really love to hear this song live, I think I’d like it more that way. The song really does showcase the girls’ singing abilities. The only thing that i don’t like is the random “Tokaikko Junjou”-like Airi-speak in the middle of the song. To me it just breaks the song’s flowing sound. It’s not necessarily a bad thing, just something I would’ve taken out. As compared to their last summer single, “Take it easy!”, “Natsu Dakara!” is definitely a more relaxing summer song, and in my opinion overall better. The song gets an A+, but I can’t think of a Buono! A-side that I wouldn’t rate that high. They are one of H!P’s finest, and I’m so glad that they switched to the Zetima label and left behind Shugo Chara!. I’m so excited for more new releases from them! 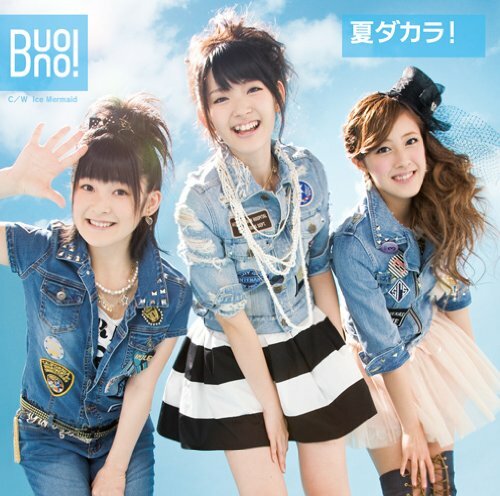 And another strong B-side from Buono!. It’s like a surfing song, but the brass throughout give it another feeling. It’s a really unique song for them (fitting seeing as the A-side is as well), but I think it’s great! This could be one of their best B-sides. It gives me the feeling that only certain songs give when i first listen to them. It’s like a chilling, “wow” kind of feeling. Whatever the feeling is, it means that I’m really impressed with the song and there’s something about it I really like. One thing I want to point out about this song is Miyabi’s amazing vocals. I love her voice in this! I think Momo really shined too. Awesome song. This entry was posted in Buono!, Reviews and tagged Buono!. Bookmark the permalink.